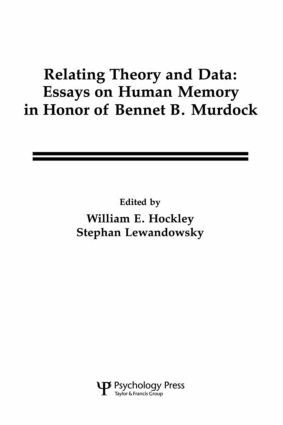 This festschrift represents the proceedings of a conference held in honor of Bennet B. Murdock, one of the foremost researchers and theoreticians on human memory and cognition. A highly renowned investigator respected for both his empirical and theoretical contributions to the field, Murdock summarized and focused a large amount of research activity with his 1974 book Human Memory: Theory and Data. This unique collection of articles addresses many of the issues discussed in his classic text. Divided into five principal sections, its coverage includes: theoretical perspectives on human memory ranging from a biological view to an exposition of the value of formal models; recent progress in the study of processes in immediate memory and recognition memory; and new developments in componential and distributed approaches to the modeling of human memory. Each section concludes with an integrative commentary provided by some of Murdock’s eminent colleagues from the University of Toronto. Thus, this book offers a diversity of perspectives on contemporary topics in the discipline, and will be of interest to students and scholars in all branches of cognitive science. Why are Formal Models Useful in Psychology? Why, Having So Many Neurons, Do We Have So Few Thoughts?